Eric Strong might be the most creative dad around. 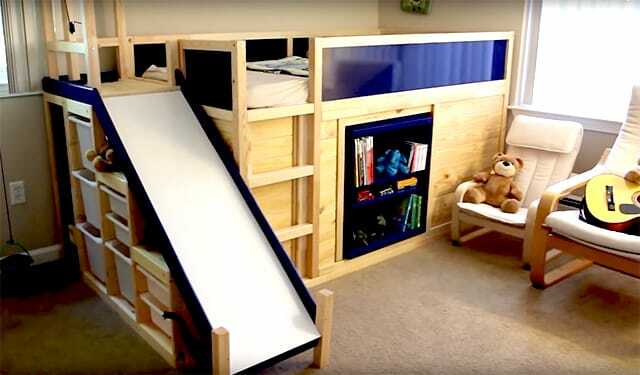 The Palo Alto, California father just designed the coolest bed ever for his son — without spending a fortune. However, “the most awesome bed ever” was out of the family’s price range. So Strong did what any handy and thrifty parent would do: He used an IKEA hack to make his own awesome bed. Then he made a video detailing the process, so anyone can follow his lead. “IKEA hacking” is a way to modify or repurpose items from the Swedish furniture store to create other items. In fact, there’s a whole community devoted to this DIY trend. Strong’s hack costs less than half the price of a comparable kid’s bed, but it’s just as much fun. Plus, if you want to follow his lead, we have ways to save even more money. He decided to base his design on IKEA’s Kura, a children’s loft bed. Many people already use the Kura as a key element in their hacks since it’s simple, fairly inexpensive ($209) and includes parts that can be swapped out and rearranged to create various layouts. The Kura’s design includes a bit of space underneath that can be easily transformed into a secret space or private area for kids, which is an added bonus. Strong worked to incorporate some of his son’s favorite things in his design: playgrounds, simple machines, rolling ball sculptures and even a favorite Berenstain Bears book. Strong started with a classic Kura bed. He assembled it in a loft style and used a three-tiered Trofast storage system underneath. He also included a Besta shelving unit, and deconstructed a second Kura bed to use the pieces (and he used almost all of them). These items, plus a bit of ingenuity, became a mini ball run (complete with golf balls and PVC pipe), and a crane and pulley with a bucket for added fun. The bed has a secret space — complete with lights — you open by tugging on a fake book on the bookcase. (How cool is that?) Strong also added a secret window his son could use to peek out from the secret space, as well as a backup escape hatch. While this bed is far less expensive than purchasing a custom-built model complete with kid-friendly secret spaces and built-in gadgets (such as this fun castle bed that that sells for $1,342), it will still cost you. That equals a minimum of $631.47. And don’t forget you’ll likely need some paint, rope and other minor odds and ends. How Can You Save Money on Your IKEA Hack? You’ll find plenty of ways to save on the hacked bed of your kid’s dreams. Follow these tips to get the components you’ll need to create the coolest bed around without going broke. Of course, make sure to earn rewards on your purchases by using your cash-back credit card or travel rewards card. If you’re moving, sign up for IKEA’s Moving Program and you can save up to $25 on an in-store purchase of $250 or more. Most IKEA stores have special “as is” sections with slightly damaged goods — those with ripped packaging, scratches, dents or other imperfections — marked down to great prices. These drawbacks might not matter to you — for example, if you know you’re going to paint the item or the damaged side will be up against a wall. Check with your local store to see if they offer special deals and deeper discounts on items in this section. BuzzFeed reports you can sometimes get 10% off on Wednesdays in this section with your IKEA Family Card. Be sure to check with your local store to see if you can take advantage of a sweet deal. Kids grow out of beds quickly, and you can likely find a family looking to part with an IKEA component or two in decent condition. Post a “wanted” ad on Craigslist or your local Facebook garage sale group, or scout local yard sales to see what you can find. If you don’t live near an IKEA and want to order items online, you can expect to pay quite a bit for shipping: large item delivery starts at $99. One way to get around this is to look for comparable items on Amazon, which generally offers free shipping for large items. This fun kid’s loft bed is similar to the Kura and retails for $222.93, but it comes with free shipping. If you’re handy, consider skipping the second bed purchase (or other parts of the project) and building similar components yourself. You can often find free scraps of wood and other construction items on Craigslist, Freecycle or simply by asking at a work site. Sourcing these free items and doing a little more of the legwork yourself helps you keep more of your cash in your pocket. Any of these ideas are sure to help you create a kid-pleasing bed like Strong’s. Your kids will want to go to bed with all these fun features — though getting them to actually sleep might be a challenge. Your Turn: Would you ever tackle a DIY bed project like this dad?